Regular readers of my blog will probably be familiar with my recent notes concerning Swindon’s small clutch of Liberal Democrat Councillors who represent the electoral ward of Eastcott and, in that post, I discussed how the residents of the ward were being subjected to a concentrated bombardment of political Porky-Pies contained in Lib Dem election material. Councillor Dave has been back, but hasn’t yet set any records straight. In fact he’s gone to some lengths to avoid answering any questions at all which, all by itself, raises yet more questions but, as Dave has already accused me of trying to divert his ‘topic-of-truth’, I thought I might chuck a couple of interesting questions out to the world at large and see what comes back. During Nicky Sewells election campaign the lib dem election leaflets variously trumpeted the messages that Nicky Sewell was a ‘local campaigner’, a resident of Bowood road and that she was fiercely opposed to ‘HMO’s, (no, not Homo’s, but ‘Houses in multiple occupation’). In no leaflet was reference ever made to Nicky Sewell and Dave Wood being a couple or apparently live together at Nicky’s Bowood Road address. Normally it absolutely should not matter what the living arrangements between two people are, unless of course they are doing something illegal while they are doing it. I’m not suggesting that Cllr’s Sewell and Wood are doing anything illegal, but my curiosity is piqued by effort Dave and Nicky are both expending as they apparently try to hide where they live from the very people that elected them. 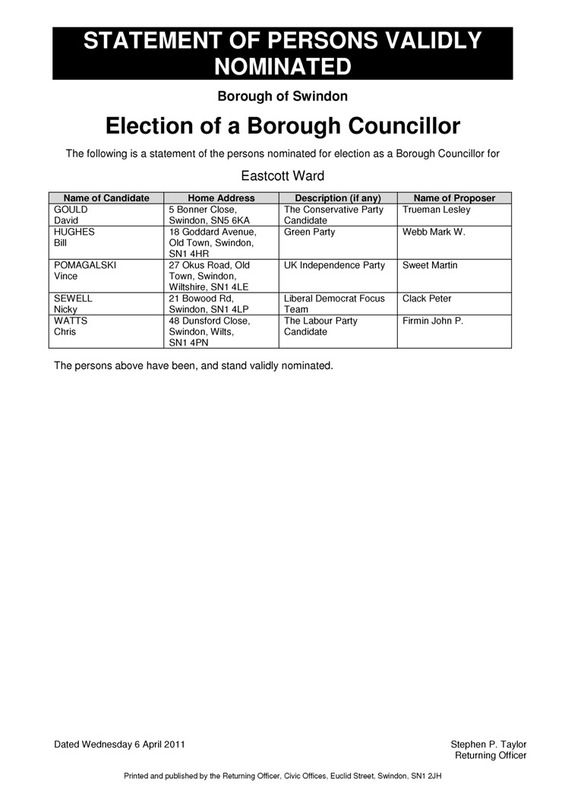 Just prior to Councillor Wood being elected to council in 2010 his nomination papers gave his address as: 21 Bowood Road, Eastcott and his proposer was none other than Nicola E Sewell, his girlfriend and also latterly known as Councillor Nicky Sewell. I presume then, that Cllr Wood does have a beneficial interest in some land or property within the Borough, but he does not wish members of the public to easily find out what, or where it might be. At this point I can only speculate as to why he wants to hide these details from public scrutiny. This strikes me a being more than a little curious and quite contrary to my previous perception that liberal democrats are wedded to the notion of demanding transparency, openness and honesty from elected public servants. Considering the considerable gravity which her election material gave to her being a ‘local’ resident of Eastcott, it seems very strange to me that both she and Dave Wood would, upon being elected to council by other residents of Eastcott, would then go to considerable lengths to hide where they live, reduce their contact details to the bare minimum and go to similar lengths to prevent the easy examination of their register of interests. Perhaps Dave rents out a house to multiple occupants, (embarrassing for him considering the Eastcott Lib Dems apparent policy on HMO’s), or maybe the pair of them don’t want Eastcotts Catholic population to know they’re living in sin. 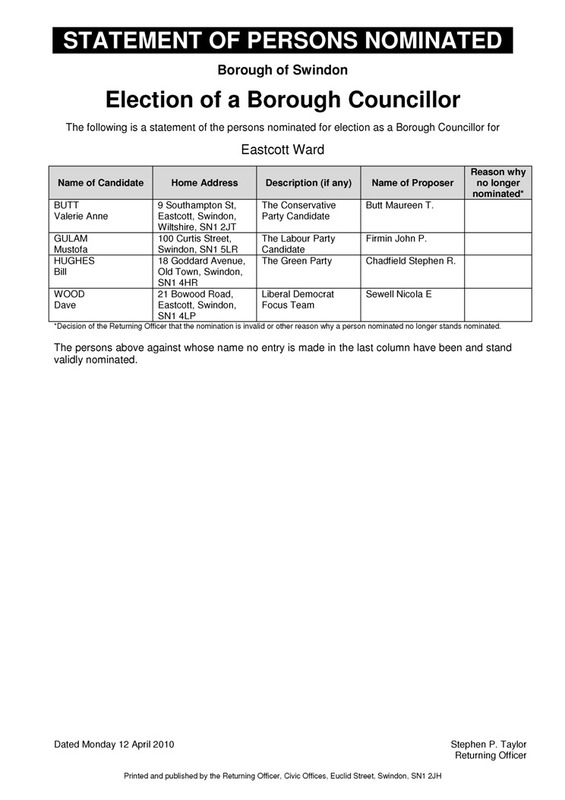 Despite what their own election material said recently, and what was submitted on Cllr Sewells nomination papers, it’s also possible that neither of them live within the ward and the Bowood Road address may not be where they actually reside. (that would cause a problem with electoral law of course). I don’t know what the answers are to be honest, (and as Cllr Wood has already said he won’t answer questions from anyone he thinks is a labour supporter - I actively supported Chris Watts’ campaign in Eastcott so I guess that makes me a labour supporter in Daves opinion), but I think this is very strange behaviour from two people who actively sought votes from the residents of Eastcott – because they said they wanted to publicly serve those residents – but then try to hide where they live and what other property they have a ‘beneficial interest in’, within the Borough. 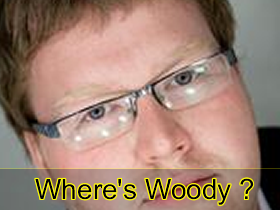 Cllr Wood is refusing to answer reasonable questions about public domain information about himself which ought to be freely and easily available. His example, which Cllr Sewell is now following, seems to suggest that they might both think that transparency is something which applies to other Borough Councillors, but not to them. I beg to differ. Given that it is a mandatory requirement that all Borough Councillors accurately maintain their register of interests and update it within 28 days of any changes, I feel it is my civic duty to stick my nose in and have a good long sniff on behalf of the other incurably curious tax-paying residents of the Borough. To that end I have today submitted the following freedom of information request. It may yet prove to be the first of several. Euclid Street, Swindon SN1 2JH. Dave Wood has a beneficial interest. Nicky Sewell has a beneficial interest. As the ‘No smoke without fire’ analogy is so often proved correct within local politics, I very much look forward to finding out what it is that Cllr’s Wood and Sewell are intent on hiding.